The Alabama State Port Authority retained McFadden Engineering to perform an environmental assessment of McDuffie Coal Terminal that would generally model an facility assessment in accordance with the Resource Conservation and Recovery Act (RCRA). This assessment is typically conducted to assess if a release of hazardous waste or hazardous constituents has occurred from a solid waste management unit (SWMU). McFadden Engineering identified and gathered information on releases that had occurred at the facility, evaluated SWMUs and other Areas of Concern (AOC) for releases to all media including groundwater, surface water, soil and air and made preliminary determinations regarding releases and the need for further actions and interim measures at the facility. 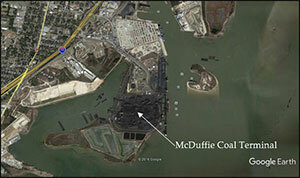 McFadden Engineering identified a number of AOCs or potential AOCs at the McDuffie Coal Terminal facility and made recommendations to ASPA personnel for addressing these items, which included an update of the facility’s spill prevention, control and countermeasure plan and pollution abatement plan. In addition, the review identified a number of best management practices to be implemented at the facility to assist with regulatory compliance. McFadden Engineering also assisted ASPA and McDuffie Coal Terminal personnel in the implementation of these recommendations.